The little giant VCC-20S 1 litre tank pump is ideal for condensate removal of water from ceiling mounted cassette systems. 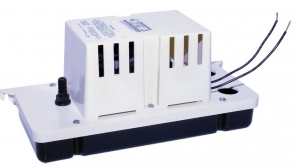 Its slim profile allows the tank pump to be fitted in restricted spaces. Two outlets with non-return valves are supplied one 1-4 the other 3-8. This condensate tank pump comes with a one year warranty and also has a high level alarm fitted.